This unique colouring book features immersive aerial views of real cities from around the world alongside gorgeously illustrated,Inception-like architectural mandalas. Artist Steve McDonald's beautifully rendered and detailed line work offers bird's-eye perspectives of visually arresting global locales from New York, London, and Paris to Istanbul, Tokyo, and Melbourne, Rio, Amsterdam, and many more. The adult colouring book's distinctive large square format offers absorbingly complex vistas to colour, the crisp white pages are conducive to a range of artistic applications, and a middle margin keeps all the artwork fully colourable. Complementing the cityscapes are a selection of mind-bending labyrinthine architectural illustrations for still deeper meditative colouring adventures and imaginative flights of fancy. 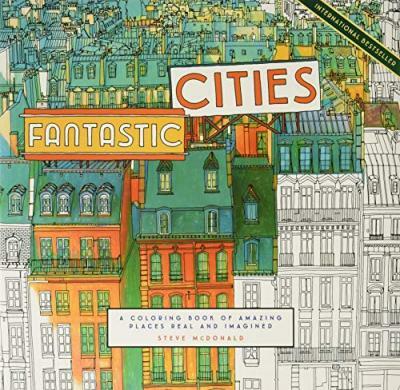 -Alfred James, Pocket Mindfulness "Fantastic Cities is an architecture-lover's dream." - Apartment Therapy "Before you set off on your next flight, grab a copy of this coloring book to entertain yourself during the journey. Even if you're not currently heading to an exotic location, the images of beautiful international cities are bound to inspire your next itinerary, or at least keep you occupied when the overwhelming wanderlust kicks in." -Health.com "Here's an activity book perfect for those lazy, hazy days of summer or those crazy days when you just need to take a break, focus on simple, creative tasks and chill out." - Stuck at the Airport "I would highly recommend this not just as a colouring book but also as a sketchbook." -ParkaBlogs "If you love the process of creating art...these books will soothe your soul"
-Sweety High "Render Manhattan or Montreal in whatever color scheme you please with Fantastic Cities, in which artist Steve McDonald's detailed line drawings offer bird's-eye views of the world's major cities." -Architectural Digest "this detailed coloring book focusing on densely packed city life, and is great for people who love coloring architecture and geometric shapes"
-Geek Dad Holiday Gift Guide Pick "A top pick for creative travelers, this adult coloring book features intricate illustrations of urban landscapes including Paris, Tokyo, London and New York by artist Steve McDonald. Much has been said about the psychological benefits of colouring within the lines (it's proven to help with anxiety and stress) and is there a more satisfying way to kill time on a long-haul flight?" -Jetsetter Holiday Gift Guide Pick "For your detail-oriented dad: show him just one cityscape and he'll be occupied for hours." Afar Magazine Holiday Gift Guide "Canadian artist Steve McDonald presents the urban landscape as a canvas for creativity--dozens of painstakingly rendered streetscapes from cities including San Francisco and Istanbul offer several fun and theraputic hours with crayons." - RackedSF An Off Duty Top 50 selection. -Florida Times-Union ..".this new book of DIY cityscapes is downright exquisite." Steve McDonald is a Canadian artist who has lived and travelled in cities around the world. This is his first book.